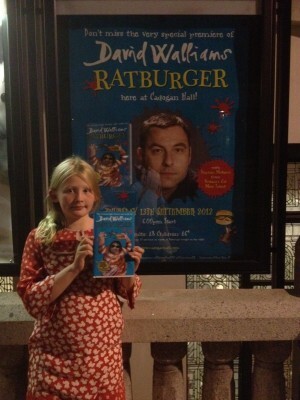 On Thursday 13th of September, I was lucky enough to be invited by HarperCollins to the launch of David Walliams’ new book, Ratburger. First we went to Cadogan Hall in Sloane Street and on the way there were lots of posters like the one in the picture. We went inside and got our tickets, then we went to the gallery where the event was being held. The launch was introduced by Stephen Mulhern, presenter of Britain’s Got More Talent . He started the show off, and then on came the much celebrated children’s writer and comedian, David Walliams! Stephen Mulhern interviewed him and then the children got to ask him questions. After that, David Walliams was in the lobby to do book signings, and the queues were so long that we had to wait two hours for them to get shorter. 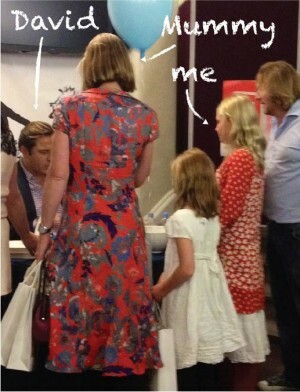 Finally we saw David Walliams in person and he was very nice and friendly. we got signed books and the book event was, all in all, absolutely amazing!